Takara turned 4! Happy birthday, Takara! We had another birthday party. Like last year (Takara was in the same shirt! 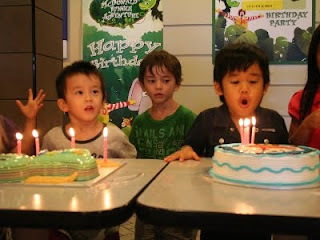 ), Reo, who turned 4 today as well, and Takara had a party together. 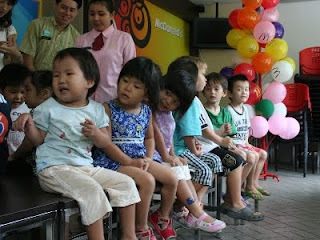 We went to MacDonald's and there were nearly 20 children came to the party. Mizuho, Reo's mum, prepared a sponge cake with Doraemon decoration. So I decided to try to order a jelly cake for a change. At first, I was looking for a branch of Q-Jelly in KL. But there's none in Penang. While searching Q-Jelly on the net, I came across a woman who makes and sells jelly cakes from home. I ordered a 28x22CM Dinosaur cake. Aratakara always love jelly and they liked the Dinosaur. But quite a few children didn't like it at all. They said they don't like wobbly jelly. Well, our choice was a bit of a mistake. It's in green colour and there are lots of pandan layers as well as coconut ones and the cake tasted more 'local Malaysian' sweet. Anyway, the person I ordered the cake is Ms Chan at 012-5513868. She does her business from Butterworth but she delivers cakes to Penang. 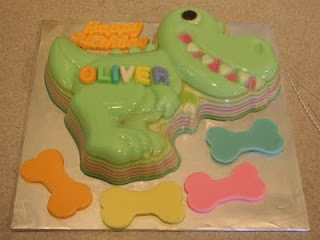 This Dinosaur cake was 55RM (=1600JPY=10GBP). During 1.5 hours party, children were playing at the small soft play area, eating snacks and doing the colouring, we brought in a colouring book for each child. After a while, party staff took them to a separate room to play games. They played musical chairs and balloon relay games with some small prizes. 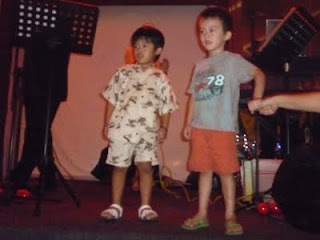 I hadn't been sure if the children could take part in the games, because most of them are either 3 or 4 years old. But once the games started, more than half happily joined them. They surely had fun. One of the most interesting things happened at that moment. 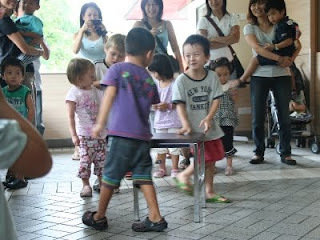 Takara and Ryota were the last 2 at musical chairs game. When music started, they looked at each other giggling, or probably they meant they were exchanging challenging glare?, anyway, and they were turning around the last one chair. The party staff was about to stop the music. Takara suddenly abandoned the game and walked towards me! What's wrong??? He wasn't crying, nor laughing. His face was just straight. I asked him what happened but he didn't seem to be able to explain his feeling. Was it too much stress for him? In the evening, we went out to the bar next door. 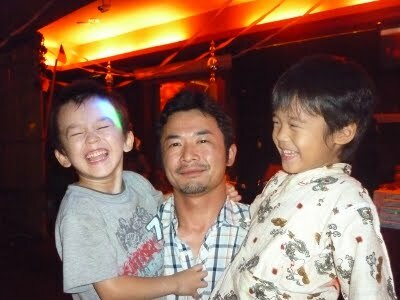 There happened to be a party event at the bar and Maki & Naoki gave us and Reo's families the tickets as presents. Thank you very much!! Of course, kids were up excitingly until after midnight. At one stage, Reo and Takara were called on to the stage and the live band played 'happy birthday' for them. It was Takara's birthday party number 3! !